In honor of their stellar performance at the 2008 Olympic Games in Beijing, Irie Jamboree, New York’s signature Caribbean music festival, will be dedicating this year’s staging to Caribbean athletes, in particular, Jamaica’s three time Gold Medal winner Usain Bolt, who shattered three world records, Women’s 200m Gold Medalist Veronica Campbell-Brown, and Women’s Gold and Silver Medalists Shelly-Ann Fraser, Sherone Simpson, and Kerron Stewart who made history by sweeping the Women’s 100m finals. In addition, it was recently announced that top ranking Dancehall artist Mavado, whose Olympic theme song “On the Go,” was written in tribute to Gold Medalist and former 100m world record holder Asafa Powell, will be making his first U.S. appearance in six months at Irie Jamboree. Upcoming Reggae artist Prestige will also be making his Irie Jamboree debut with his Olympic tribute “Olympic Feeling” on the festival inspired Rivival Riddim (Rhythm), which pays homage to Bolt, Fraser, and Powell. A special Usain Bolt tent will be established at Irie Jamboree, appropriately dressed in Jamaican colors and used as one of the VIP suites. The Usain Bolt tent will be supported by Digicel, one of the lead sponsors for Irie Jamboree. 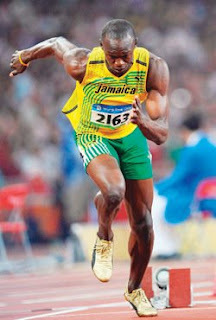 This follows on the close relationships forged between Usain, Digicel and Irie Jam Radio at the Reebok Grand Prix in late May when Usain first created pandemonium by smashing Asafa Powell’s sprint record to become a contender for the title of the fastest man on earth. The organizers will also work with sponsors Western Union, Pay-o-matic and Grace Kennedy to decorate the “Veronica Campbell-Brown” Media Tent which will honor our Olympic Queens. The food court will also be re-named the “Caribbean Olympic Village” to honor all Caribbean athletes who competed at the Olympic Games this year. Irie Jamboree is also expected to be a media feeding frenzy for international music press, with journalists coming from Japan, Europe, South America, the Caribbean, and all across North America. “Our company, and especially our radio division, Irie Jam Radio has a long history of participation in track & field athletics, and when we looked at the jaw-dropping, gravity-defying performances in Beijing, it was really the logical move to dedicate this year’s festival to our athletes“, Bobby Clarke, CEO of Irie Jam Radio commented. Irie Jamboree will commence on Sunday, August 31st at Roy Wilkins Park in Jamaica, NY. Confirmed acts include Mavado, Elephant Man, Sizzla Kalonji, Beenie Man, King Yellowman, and Prestige.